Our day began long before sunrise with cries of "Mazal Tov" (Karen's daughter got engaged the night before) and "I hardly slept". Shortly after we dropped lower than sea level, we arrived at our starting point, the Paz gas station at the foot of the Arbel, right outside the town of Migdal. Walking along a small stream, enveloped in lush growth, we were not sure how we could scale the steep cliff 400 meters above. 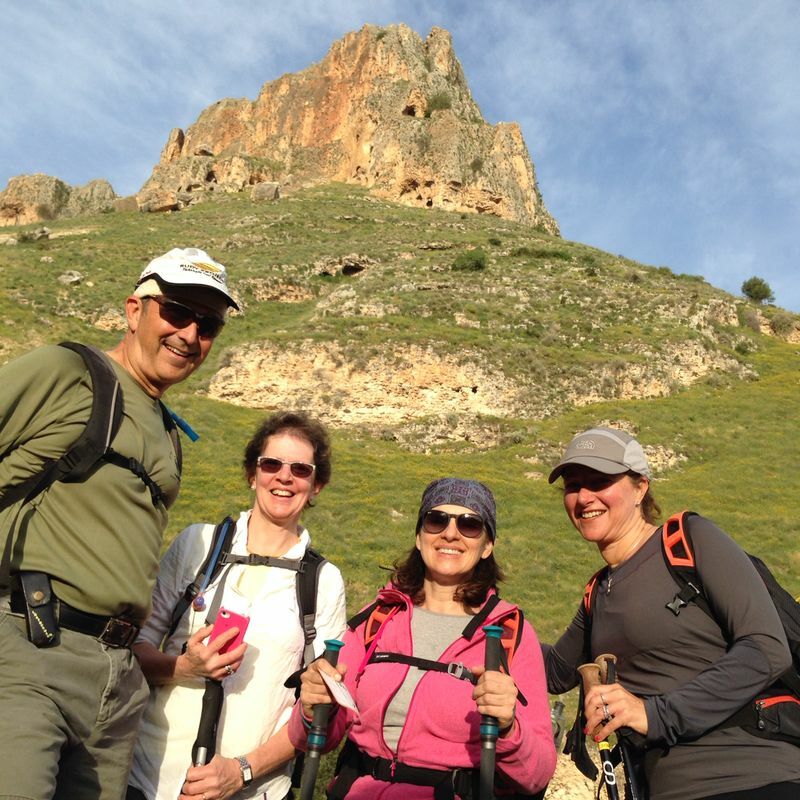 An hour and half later, all four of us were atop the Arbel, feeling literally on top of the world. Along the way, we bumped into a hiker from Wisconsin who we had met on our last hike near Shoham. He had just come out of a cave where he spent the night, and was continuing northbound. From there on, the hike was hilly but easy going. We were treated to breathtaking views of the northern Gallil, the Golan and of course the glistening sea below us. We passed Kfar Hittim, site of a famous historical battle where Salach a Din defeated the crusaders in 1187. Today Kfar Hittim is the place where a multi million dollar golf course was ALMOST built. We hiked south through Mitzpe, a sleepy village, crossed highway 77 which leads to Tiberias, and walked across the main drag of upper Tiberias, into the Switzerland Forest. The comforting thought of ending the hike in a shady forest was lost when Chaim told us there would be no shade. The Switzerland Forest bears no resemblance to a forest, let alone a Swiss one! Nonetheless, it was a beautiful park. The park was originally planted in the late 1920's to combat the life threatening problem of landslides which resulted from rock and soil erosion on the steep mountainside. The park was sponsored by the Swiss Jewish community; thus the name. We finished 19.5 km, piled into a taxi that brought us back to our car, and were excited for the upcoming engagement party!